I thought I'd never read a book sadder than The Chocolate War, but I was wrong. 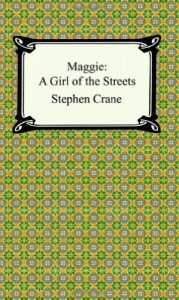 Maggie: A Girl of The Streets is desolate. What I found most disturbing about it is that Maggie largely doesn't have parents, and certainly not loving parents. Both parents are alcoholics, and the father dies early. The mother is a brute who often smashes furniture in drunken rages. When Maggie disappears from the family's house while dating Pete (which is never really explained), her mother and older brother conclude that she's behaving scandalously with Pete, and disown her. This, and the mother's rants about how she raised Maggie better than that, make her hypocritical. I note that characterization is not a strength of this novella. Maggie's mother is a completely flat and static character; so is Pete, and probably Jimmie, the older brother. The glimpses into Maggie's mind are limited; only during her dates with Pete do we see her thoughts extensively.